"Crazy" Joe Tritschler has made a name for himself in the rockabilly scene with his own group, the Mad River Outlaws, as well as extensive touring and performing with the legendary Deke Dickerson and the Ecco-Fonics. 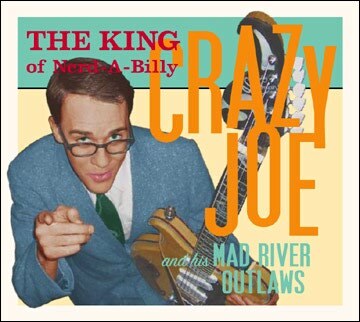 Yet when Deke hinself crowned Joe with a new title - "The King of Nerd-A-Billy" - even Joe couldn't fathom that a whole new chapter in the genre would emerge. This "it's cool to be square" music has no boundaries. The King of Nerd-A-Billy takes an important step forward in terms of vocal talent, songwriting ability, and production standards while never relenting on the guitar front in the slightest. The new full-length album by Crazy Joe and his Mad River Outlaws shows them harnessing the full range of classic American styles - all the while imprinting an unmistakabky unique, fresh stamp of their mix of vocal numbers, not-so-familiar classics, and smoking instrumentals ... and this only touches the surface of what you'll find on Crazy Joe's third CD.